We consolidated natural gas supply and demand prospect information on NEA countries (Russia, China, South Korea, Japan and Mongolia) in 2020. Russia and China are countries in NEA with high natural gas production. The forecasts on natural gas production in China in 2020 will reach 120-150 BCM. Meanwhile, East Siberia and the Far East of Russia are expected to produce 153 BCM in 2020 and about 70 BCM of it will be exported to other countries. In all the NEA countries combined, the total natural gas demand in 2020 is expected to reach about 380 BCM. Natural gas demand in China will increase dramatically reaching more than 200 BCM in 2020. This is almost three times higher as compared with the current level. Natural gas demand in South Korea will grow steadily towards 2020 and its amount is expected to reach 49 BCM, which is higher than one and a half times as compared with the current level. Prospects for Japan show the most modest growth among the NEA countries. Natural gas demand in 2020 is expected to be about 80-90 BCM. Production capacity and demand balance of natural gas in 2020 suggests that the natural gas export from East Siberia and the Far East of Russia (70 BCM) could cover around 20%of the gas demand of rest of the four countries in 2020. We estimated the interregional natural gas flow in 2005 and 2020 including both PNG and LNG. As compared to the situation in 2005, the increase of natural gas demand in China is remarkable. The majority of the export from Russia to the APR is PNG except for Sakhalin LNG. PNG is internally transported in China for domestic use. LNG continues to play the main role of natural gas trade in Japan and South Korea. China is expected to import more LNG from Australia and the Middle East. Based on the natural gas supply and demand prospects, we developed a long-term vision of natural gas infrastructure including LNG as well as PNG. In Russia, pipeline network will be constructed as a UGS (Unified Gas Supplies) system which connects West Siberia, East Siberia, the Far East and the markets in the APR. In China, the construction of natural gas pipeline and LNG facilities will be further accelerated. 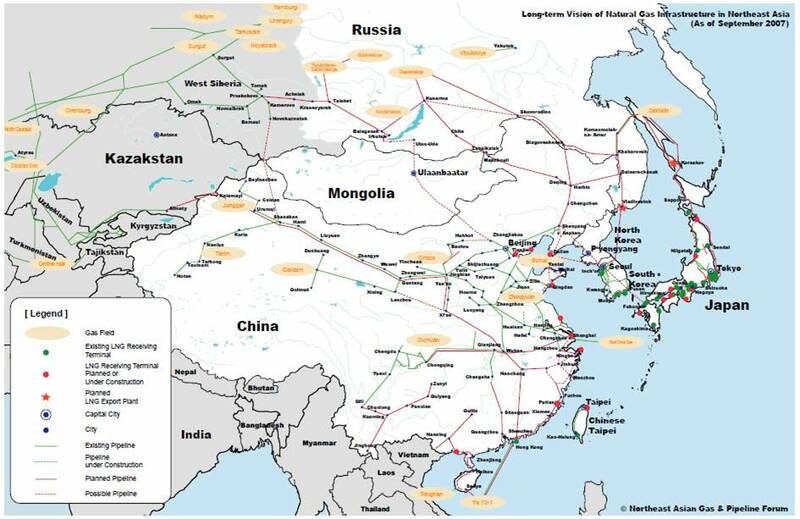 The gas pipeline constructions include the following: the connected and networked trunk gas pipelines, the planned gas pipeline from Sichuan to Shanghai, and the second line of the West to East Gas Pipeline (from Xinjiang to Guangzhou). The LNG terminal developments include putting the Shenzhen LNG facility into production, the construction of the Fujian and Shanghai LNG terminals, and the construction of 3?4 planned LNG terminals in the Jiangsu province. Furthermore, the development of natural gas infrastructure in China during the 11th five-year period enjoys a high priority. South Korea is increasing the capacity of its existing terminals (Pyongtaek, Inchon, and Tongyeong) operated by KOGAS. In addition, POSCO recently completed the construction of an additional terminal at Kwangyang. The cross-border pipeline from the Sakhalin GPC in Russia to South Korea via Vladivostok for the purpose of imports will be constructed. In the future, gas from the Yakutiya and Irkutsk GPC will be transported to South Korea through the UGS network in Russia. Japan has become the largest importer of LNG in the world; there are over 20 existing LNG terminals including the new facilities?the Sakai and Hakodate LNG terminals. Several terminals in Hachinohe, Joetsu, Omaezaki, Wakayama, Mizushima, Sakaide, and Matsuyama are expected to be constructed. In the future, over 30 receiving terminals will be located along the Japanese coast. The Sakhalin-2 project will start exporting its natural gas to APR countries including Japan in the form of LNG from 2008. Major electric power and gas companies have already signed the LNG purchasing agreement. It is the top priority of the three highest energy consuming countries in NEA, that is, China, Japan, and South Korea, to secure significant amounts of energy in order to maintain economic development. Japan and South Korea in particular need to enhance energy security and secure a stable energy supply by reducing their dependence on the Middle East for energy and diversifying their energy supply sources. The share of natural gas should be increased to lower CO2, NOx, and SOx emissions in terms of global and regional environment conservation. In China, in particular, increasing natural gas utilization and switching from coal to natural gas can contribute to decreasing air pollution and reducing the damage of acid rain. Russia possesses the world fs largest natural gas reserves. Siberia and the Far East lag behind other regions in European Russia in terms of economic development. However, these areas are expected to earn foreign exchange by exporting natural gas. Except Japan and South Korea, NEA countries lag behind in the implementation of energy saving technologies. Natural gas is a suitable fuel for energy saving technology in the future, such as gas combined cycle generation in the power sector, fuel cells in the industry and household sectors (subject to hydrogen production by reforming natural gas), CNG vehicles in the transport sector, and fuel cell vehicles (subject to hydrogen production by reforming natural gas). Japan and South Korea can contribute to energy saving in NEA by expanding its advanced technology to include natural gas. Natural gas infrastructure in NEA is already in the implementation stage, and it has a significant and long-term positive impact on not only the region but also the whole world. We hope that this vision will be realized in the near future through the close cooperation and coordination of relevant parties, and the NAGPF would like to continue its effort to encourage and act as a catalyst for its realization.